Well, there’s nothing to say about this article. You have to see it. And of course you now know how to make Nutella in the forest. 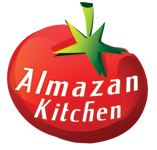 Do not worry a cheat sheet from the AlmazanKitchen included! Recipe is down below! Crack 1 organic egg and mix it with 1 hand of flour, ½ tbsp. sugar, 1 tsp. of salt, 1 tsp. of baking soda. Add ½ cup of milk, mix very well! Melt 1 tbsp. of butter then mix with batter! Unpeel the hazelnuts from the burned skin then smash and grind it in the mortar using pestle. Add 1 tbsp. of honey, mix. Add 3 tbsp. of cocoa. The hardest part: Mix veryveryvery well! Add ½ cup of cream and mix well again until very rich texture. Preheat the pan. Melt 2 tsp. of butter. Form few rounds with a batter, cook until brown from each side. Serve separately or build a tower covering each pancake in nut butter.